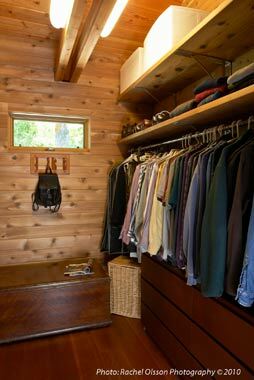 An 8' square master closet with 10' high walls provides ample storage for this his and hers walk-in closet. 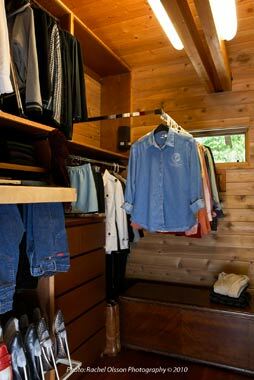 Pull-down clothes racks, pull-out pant rack, pullout shoe rack and valet bar keep the ladies clothes neat and organized. The man requested a simple chest of drawers with hanging bar, nothing more. Custom stainless shelf brackets make the most of the available space above the hanging bar. Lighting on either side of the beam provides excellent illumination for items above the hanging bars as well as the clothing below. An antique cedar chest offers storage as well a convenient place to sit when putting on or taking off socks and shoes. Collapsible wall hooks provide a convenient location for hanging readily used items.